The burgers were of a decent size, although there was a stark difference between the Uncle Sam and the Mac Attack, with the latter being humongous and actually difficult to eat as a burger. My Uncle Sam burger held together ok and had a reasonable patty to bun ratio. The mac attack was a little over-facing. The fries were hit and miss, with some undercooked. The wings with buffalo sauce were not too bad. Having the choice on the size of the portion was a nice touch. The cocktails were average, with the frozen ones being closer to a mild slush and flowing over the top of the glass. We had to use some kitchen roll to mop up the overflow. The French martini seemed to have an unusual taste too. Service was friendly, although their electronic payment systems were down which significantly slowed down leaving. Admittedly that wasn’t probably their fault. Based on the Royal Mile, this place unsurprisingly attracts a large amount of tourists. It gives the place a bustling atmosphere but suited the style of eatery. Seemed a little steep for what we got but we were on the Royal Mile, so is almost to be expected. Compared to other burger venues in Edinburgh, it isn’t that competitive. Would I eat here again? Yes, but it probably wouldn’t be the first choice for a burger. After some festive dancing on George Street at the Silent Light, a couple of us decided to reward burning those calories by stuffing our faces. We decided to chance it at 83 Hanover Street and we’re lucky that they still had a couple of tables free. 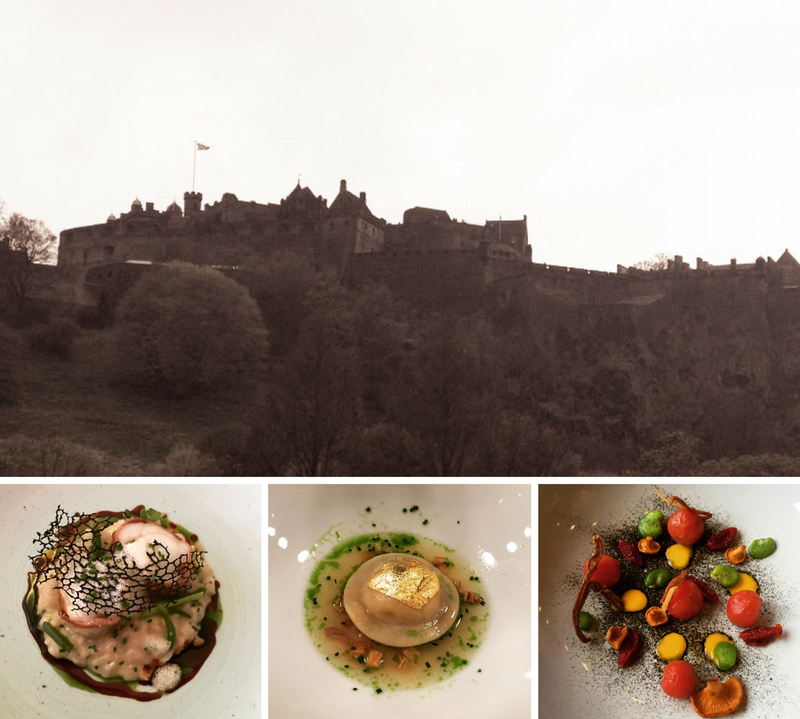 83 Hanover Street aims to blend Scottish and Chilean cuisines. As seems to be the theme with my recent reviews, 83 Hanover Street offer small bites and plates to be shared. We chose braised pork collar croquettes and calamari from the bites section and hangar steak and halloumi fries from the plates section. The croquettes came out first. Three crispy balls were sitting in an apple and chilli jam. The croquettes were stuffed full of pork which tasted wonderful alongside the jam. A great combination. Next came the halloumi fries which were the biggest triumph of this meal. Tons of fried halloumi, covered in drizzles of red pepper ketchup and lime and coriander aioli. Some sliced chillis were also scattered across the top. The cheese was delicious and cooked to perfection. I could have eaten more than one plate of this. Then the calamari appeared. This came with a merken (smoked chilli pepper) aioli, sliced chillies and a wedge of lime. Whilst cooked ok, it was a little uninspiring and possibly a touch under seasoned. The aioli was nice but couldn’t entice us to finish this plate. Lastly, the hangar steak. The steak was spice rubbed and was served with a fried egg, onions and sautéed potatoes. The egg oozed nicely and pulled the dish together nicely. The steak was of good quality and cooked well. We enjoyed our visit to 83 Hanover Street. It won’t set the world alight but it will be a decent meal. Would I eat here again? Possibly. Lucky Yu Canteen is a tiny restaurant on Leith Walk aiming to meet your dumpling needs. My friend booked via Facebook but it seems they didn’t have our booking. They were as accommodating as they could be and squished us round a corner table, which actually was enough space for us, with a bit of space management on the table. We were provided with a menu and pencil, where we could indicate how many of each item we would like. We were recommended to get several dishes (albeit a couple were not available that evening), so that was exactly what we did. Whilst gyoza are their main offering, there are other bits and pieces available too. We chose edamame beans, Thai prawn crackers, karaage chicken, fried chicken katsu sando, roast chicken gyoza, dirty burger gyoza, tiger prawn gyoza, the day’s special gyoza (cheese) and a lobster and chorizo bao bun. This place is BYOB so we just stuck with soft drinks. The small plates came out first, as and when they were ready. The edamame beans were great, with a smattering of smoked sea salt. The prawn crackers were also excellent. The karaage chicken were popcorn bites deep fried and came with a saamjang mayo which was delicious. However the most popular of the small plates was the katsu sando. Essentially a sandwich, with fried chicken and a lovely katsu sauce. This was succulent and filling. The gyoza and bao followed. The gyoza were steamed and had seen a pan before reaching us – just how I like them. Two of the gyoza came with dips and two did not. Let’s talk about the dirty burger gyoza first. Yes, it’s not traditional but you really should try them. With a mustard dip, these were both fun and tasty. The chicken gyoza probably averaged out as the favourite but they were all pretty decent. The filling was generous in all of the gyoza. Top stuff. The bao was also packed full of filling but it was felt that it needed more of the chorizo in it, as the flavour wasn’t strong enough. After a bit of a wait, we ordered some dessert bao, which came in the form of a deep fried mini bao with a choice of an ice cream. We picked the pear ice cream. These. We’re delicious and the perfect way to round off the meal. We decided to visit Miss Woo’s in Leith without booking, but even early Thursday evening meant we couldn’t get a standard table and had to perch to eat along a bar ledge. I’m not sure if it’s just because they have an itison voucher at the moment (which we didn’t have) or its just popular anyway. Either way, book in advance just in case. The menu is relatively simple, breaking down into fries, gyoza, bao buns, wings, ramen, pad thai and sides. Even though we didn’t have the voucher deal, Miss Woo’s has a very reasonable deal of one cocktail plus 3 items from a highlighted selection on the menu for £18, which we decided to try. I chose a Miss Woo Woo cocktail and then pork gyoza, Asian bbq chicken wings and spicy Korean pulled pork bao buns. My friend chose the same wings and buns but opted for the Bangkok dirty fries instead of gyoza. The food came out pretty much at the same time. The Bangkok dirty fries had pulled pork and chillis slathered over the top of the fries. These were really substantial and enjoyable. The bao buns were beautifully soft, although it was a little annoying that they stuck to the cardboard container there were served in. The hot and sour flavours were great. The pork dumplings were served in a bamboo steamer basket and were cooked well, with a decent amount of filling. Dipping them into soy was lovely. However, my favourite was the Asian bbq wings. The portion was generous, with each wing having a good amount of meat on it. The glaze was sweet and smoky in equal measure. I could eaten three servings of that! We did originally get charged with the full price rather than the deal price but this was quickly fixed. We enjoyed our trip to Miss Woo’s and will definitely head back to try more of the menu. Would I eat here again? Oh yes! A friend and I took a stroll along the Water of Leith one sunny Sunday and ended up Crolla’s for an ice cream. Situated at the Shore, we sat at the window with a view of the water whilst absorbing the 50’s diner feel inside. We had originally gone in for a small ice cream but easily got swayed both by the serving area and the menu and ordered a cold stone ice cream and a sundae as well as a couple of drinks. They also serve savoury food should you have company with you who does not like ice cream (and frankly, you might need to question your friend choices!). So I mentioned I had a cold stone ice cream. This is where you choose your ice creams and inclusions and get it all mashed together on a cold marble stone to make a brand new ice cream. Top it with sauce and away you go. For those of you less creative, like me, there are some suggestions of creations. I chose the chocolate minty madness. On delivery to our table, I was a bit shocked by the lurid green sauce splashed across it but it actually tasted ok. The ice cream itself was lovely and the chocolate buttons mashed through were yummy. Across the table from me, I did have a bit of food envy with the sundae. The lovely shell shaped glass held lots of ice cream, sauce and cream to scoop your way through. They do my beloved cookie dough creations here, so I will definitely have to pop back for another visit, even if it’s not sunny. Midweek curry on a grim drizzly day is a definite pick-me-up. Vinyasa can be found just off the Royal Mile and we were warmly welcomed on arrival. We immediately got to drooling over the menu, with plenty of familiar dishes on the menu. We had to wait a little while to place our order but when we did, we decided to get a load of poppadoms to start (standard) and then picked a variety of curries. I chose the chicken balti, as I always do when I spot it on a menu of a place I’ve not been before as it’s a good yardstick for me. I also ordered a garlic naan to scoop up the curry sauce. The poppadoms and chutneys were great and as usual, we all had to restrain ourselves from devouring them within seconds. The chutney tray was pretty standard but as usual, the mango chutney was the one that was demolished. Next, the curries. On delivery to the table, you may feel they appear on the small side, appearing in small but deep dishes, but actually I found this meant that I could completely finish my curry rather than having to admit defeat three quarters of the way through. Also, it meant there was a greater meat and vegetables to sauce ratio, which was mightily satisfying. I think everyone around the table enjoyed their curries. The rice and naans were also delicious. We had to wait again to get and pay the bill but we felt it was worth it for the quality of the food. A nice place if you are around the Royal Mile vicinity. As regular readers of this blog will know, I am friends with Emma from Vegan Edinburgh and Ann from A Quirky Lifestyle. Emma had been invited along to the Hungry Herbivore supper club at The Pantry, so Ann and I thought we’d get ourselves tickets and keep her company. The Pantry have a number of venues across the capital now, but this supper club was at the Colinton branch, which is a beautiful building both inside and out. All the diners were sat communally around two long tables and the set menu for the evening was on each place setting, studded with a sprig of rosemary. I did look a bit odd sniffing my menu but I didn’t care. The manager introduced us to the evening, which was vegetarian (with vegan adaptions already built into the menu). Almost all the paired wines were vegan too – and when they weren’t, a vegan wine was still provided as an alternative. We started the evening with some appetisers, which consisted of a trio of dips. There was beetroot hummus; chickpea, pumpkin and cumin; and butter bean and spinach. They were served on small pieces of seeded bread which were made in-house. As you can imagine, these had great colour and tasted yummy, but could have possibly done with a touch more seasoning. The next course was creamy wild mushrooms with garlic and parsley, served on sourdough toast with a runny duck egg. The egg was not served on the vegan dish. This was a lush dish with the egg oozing beautifully over the mushrooms. The mushrooms managed to still feel substantial and carried a wonderful flavour as well as texture. Top notch. We then moved onto the herby gnocchi as our main. This was probably my favourite of the courses. The gnocchi came with pesto, grilled courgettes, peas, pine nuts, pea shoots, fridge and radish. It was a truly spring dish and danced in my mouth with flavours. Again, I’d have liked a little more seasoning but it’s a minor quibble. The vegan offering had different pasta but otherwise had pretty much the same elements. Dessert came in the form of a lemon and blueberry fool. This consisted of lemon curd, meringue, blueberry compote and whipped cream. This was a refreshing palate of flavours and finished the meal off nicely. Emma had a lovely hunk of orange cake, which she kindly let me try. It was light and zingy. She was exceedingly happy with her dessert. We had fun at this evening and they are holding different themes at each supper club, so it’s worthwhile checking out their website for something that might take your fancy. Cost £39 per person or £59 for two, including wine.